Ski-Doo‘s race department is hosting a race seminar at Quadna Mountain Park in Hill City, Minn. to help Ski-Doo snocross racers prepare for the season. The event is scheduled in advance of the ISOC season opening race in Duluth, Minn. The seminar will focus on snocross set ups for the rider’s sleds and include coaching and tips from Ski Doo Factory Personnel and Pro race teams. Advance registration is required. Optional Track Time is available at a discounted rate for two days (Ski Doo Racers only). All attendees should be ready to ride to get the most out of their time. Riders can select to participate in either the Classroom Seminar or Optional Track Time, or take advantage of discount rates and do both. After three hours of classroom discussion, riders and crews will be able to test their newfound knowledge and work hand in hand with experts to increase their podium finishes. 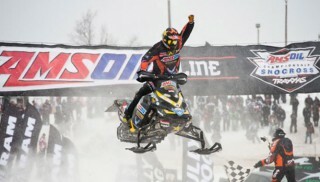 The Ski Doo Parts Support Truck will be on hand to help with parts, questions and setting up racer accounts.